Having seen the Mayan architecture at Chichen Itza first, Uxmal felt much different from the very moment I entered the site and saw the imposing mass of the Magician’s Pyramid towering over me. And this structure is very much a different style of architecture. Where the pyramids at a place like Chichen Itza are very angular, as you can see, the great temple at Uxmal is rounded and curvaceous. There’s a style of Mayan architecture at Uxmal known as Puuc architecture, a style unique to the Puuc hills of Mexico. The Mayan architecture in those hills was also an expression of the environment. Other Mayan cities of the Yucatan sat over cenotes, massive natural holes where underground water was plentiful. The cities of the Puuc region built large cisterns to collect rain water in the rainy season. Water was not in abundance in these dry hills which may play some part in the unique style of Mayan architecture there. Some recent theories suggest that the collapse of the Mayan civilization may be down to droughts that occurred in the region prior to Spanish colonization of the Yucatan. If that’s the case, certainly places like Uxmal with no natural water source would have been the first to suffer. And the name of the Magician’s pyramid may even be a slight nod to the catastrophic change in fortunes for the Maya. When the Spanish arrived, Uxmal had already been abandoned. This is one of the reasons so many of the Mayan buildings have Spanish names. But not this particular pyramid. The name of this pyramid comes from legends told by the Mayans who still lived near Uxmal when the Spanish arrived. These stories involved a dwarf or a magician – depending on who told the story. He arrived one day and, on a dare, built the massive pyramid overnight. To those survivors their own Mayan architecture seemed beyond anything their own ancestors could have built. Hence the magical legends of its construction. I have always found the Mesoamerican cultures fascinating and seeing the rich variety of Mayan architecture has been a highlight of my trips to Mexico. I’d love the opportunity to re-visit the places I’ve been as well as explore more of the Mayan ruins that dot the region. It’s truly amazing to stand before these temples and this particular print really captures that larger than life feeling of the main temple at Uxmal. Have you also visited Uxmal? Or are you just fascinated by the cultures that built the architecture seen in this Mayan print? I hope you might take a moment to share what speaks to you most in this, my best selling Uxmal print? 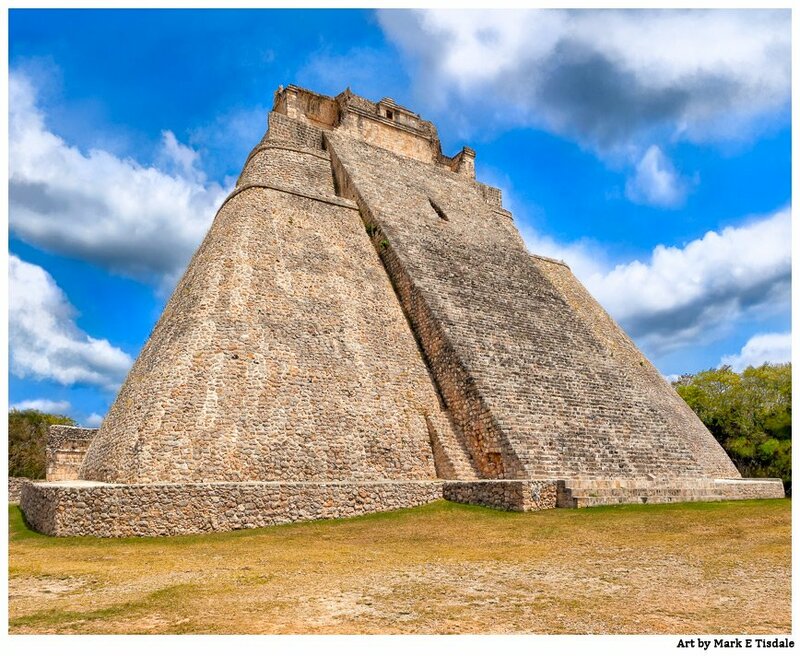 Note: Uxmal is a UNESCO designated World heritage site.